We believe in direct mail, when it’s done properly. Everybody throws away tons of junk mail, but by fallowing a few guidelines you can help ensure that your piece of direct mail won’t be tossed. Coincidentally, it just so happens that we’ve recently created a couple pieces that adhere to those guidelines. The first postcard advertises a Back to Shool sale for Cellular Skateshop. The piece comes with the opportunity to win a Wii to customers who visit the store during the sale along with significant savings on popular brands. It was delivered only to a list of previous Cellular customers. The 2nd postcard was delivered only to high-end area restaurants and explains that good interior design has a strong effect on a restaurant’s bottom line. 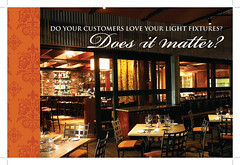 It encourages the restaurants to call Mary Jane Kempton Interior Design for a free design consultation. Both postcards were just sent out this week, so it’s too early to judge their effectiveness. A good direct mail run generally generates a 1-3% effective response rate, but with such targeted lists we’re hoping to do a bit better.